This healthy food list is a selection of everyday superfoods that are especially healthy. 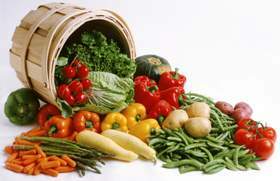 Organic vegetables and fruit eaten fresh, raw or lightly cooked are super-healthy. Understanding the superpowers of some of these foods might encourage you to eat them more regularly. All vegetables and fruits are good sources of antioxidants. Antioxidants help the body deal with toxins that are built up in the course of natural processes. They also work to reduce the side-effects of environmental pollution on the body. Anti-oxidants counter excess oxidation by destroying the free radicals which can damage cell walls and DNA. Phytonutrients are also present in all fruits and veggies, not just those on the healthy food list. These are beneficial chemical compounds found in plants that are useful and vital to our health in various ways. Scientists are still discovering the diverse properties and benefits of phytonutrients. Diversity in your diet is essential. Try to eat a rainbow of vegetables and fruits each day. Eating different coloured fruits and vegetables help ensure you’re getting a good coverage of the different vitamins, minerals, antioxidants and phytonutrients that your body requires. The health benefits of apples have been recognised for centuries. Apples aid digestion, particularly of fatty and protein-rich foods. They contain nutrients that help the body manage cholesterol levels. Bananas are a good mood food . They are high in tryptophan, which helps the body produce the tranquilising brain chemical seratonin. Eat them ripe for best effect. Bananas also contain potassium, magnesium, zinc, folic acid and calcium. Bananas are soothing to the digestive tract and can be used to treat constipation and diarrhoea. They are high in pectin fibre which the body uses to eliminate toxic wastes. Beetroot is an excellent blood cleanser and tonic. It is beneficial to the liver and digestive system, and is believed to contain anti-carcinogenic substances. It aids the uptake of oxygen in the body and boosts the immune system. Broccoli is believed to have protective powers against cancer. It is rich in iron and vitamin C (as long as it’s not overcooked), beta-carotene and folate. Capsicum is an excellent source of vitamin C, with the red and yellow varieties containing up to 4 times the vitamin C of oranges. They also contain betacarotene, iron and potassium. Garlic has been cultivated since ancient times for its massive healing powers. It is famous for its ability to boost the immune system and protect against infectious diseases. Garlic can be used as a treatment for respiratory illnesses like flu, coughs, colds. Regular garlic intake also provides benefits to the cardiovascular system. Ginger has also been used for thousands of years as a medicine for treatment of respiratory and digestive ailments. Ginger enhances digestion by increasing the activity of digestive enzymes and lipase. It has been used to treat stomach and intestinal complaints and stimulates bile flow. Adding ginger to your cooking helps prevent the stomach lining from damage. Used in marinades to tenderise and flavour meat, ginger can also be active in killing off various types of flukes, nematodes and worms. Ginger can also be useful for treating travel sickness. The dark green of parsley is an indication it is high in chlorophyll. It’s also rich in vitamins A and C and the minerals iron, calcium and potassium. It can be used as a diuretic, aids digestion and can be used to treat gout and rheumatism. Spinach is filled with the potentially cancer-fighting caretenoids. It’s also high in chlorophyll and iron, notorious for giving Popeye his strength. However spinach also contains oxalic acid which counteracts the body’s absorption of iron. Remedy that by consuming extra vitamin C when you eat spinach. Sprouts are amazingly cheap and easy to grow and stacked with protein and nutrients. Click here for information on how to sprout beans.